What is this book about? It tells us that we all live in a world of abundance. In our world, there is plenty of food, money, housing, cars, men and women, children, health, love, fame, places for rest and recreation, and more. God created everything in plentitude. Then why is it that some people have some things in excess, while others in deficiency? Although, if you have a lot of something—for example, money—at the same time, you may not have enough of love or health. Conversely, if you have lots of love and are healthy, you may be in desperate need of money, etc. Only few people in the world have really everything that they need or want. We call them lucky, and sometimes we even believe that such people have not fully deserved their success and happiness and that all their success is just a fluke in the eyes of God. These lucky individuals sometimes think so, too, and they do not give much thought that they created their joy and good fortune themselves. Can any of us become one of the happy people? Yes, if we behave in the same way as successful people. Everything Depends Only on You! We will not discover anything new by saying that, in order to achieve success, you should behave as successful people do. This idea is described in detail in numerous books. I will not repeat it again because the authors of those recommendations described the external behavior of successful people—the way they work, plan their activities, speak, etc. To some extent, these recommendations are effective, but only insofar as the inner world of a reader conforms to the inner world and beliefs in the system of a successful person. As you understand, there may be a significant discrepancy between these worlds. You may endlessly pursue goals, plan achievements, or work eighteen hours a day. Yet, if deep inside, you consider your boss a fool who takes the wrong place, then you will achieve negative results, i.e., you may be demoted to a lower position or even fired. On the one hand, it seems that you did all a successful person would do; on the other hand, why is there such a failure? The reason is that, besides the aspects of external behavior, there exist several other very important rules that we should observe when interacting with people. These rules are quite simple. If we break them (millions of people do it all the time), life will give us a lesson. Such lessons are not as minor as getting a bad grade for not doing our homework in school. If we do not understand these lessons, Life will block much of our efforts toward achieving our goals. No matter how energetic you are and how hard you try to achieve your goals, you will not accomplish the desired results. You will not become one of Life’s favorites, as you will fall far behind, becoming a failure. On the other hand, if you understand Life’s simple lessons and do not violate a few important requirements, you will become a Life’s favorite child. As you can imagine, it is very pleasant to be loved by Life. Most of your goals will be achieved without much effort. You will live in inner harmony and joy. You will not be afraid of the future anymore because Life would not harm its favorites. This might sound like a miracle to you, but it is a reality, and it can always be with you. It only depends on you whether you can easily become one of the most fortunate people. Someone in the invisible world helps people to observe those easy rules of living in our world. We call this invisible and protecting guardian God, Angels, Heavenly Powers—you name it. Our method is not religious, so we will simply use the notion of “Life,” which you can attach to any notion that corresponds to your beliefs. Readers are usually curious about the author of the book they read, so I will tell you a little about myself. I was born in Russia in an ordinary family. I graduated from high school, got some work experience, and earned two university degrees. I did not experience any significant failures or great accomplishments in my life, like the ones you may read about in some books. For example, I did not get my body lethally sick, only to recover later after an immense effort. I have never been to jail or gone bankrupt, I have never been on the verge of suicide, and the authorities have never been after me. I certainly had problems at work— conflicts with authority figures, which sometimes led to me being fired. I had serious difficulties with my family life that eventually led to divorce. Now I am married again and married happily. So, my life goes on, the way it does for many other people. The only thing that distinguished me from others was my tremendous curiosity. I always tried to understand why vii everything happens as it does. Why do people face so many problems, why are they always separated by religious, ideological or some other struggle? Finally their lives are often full with suffering and dissatisfaction instead of joy and harmony. Is it actually the right state of things? Not finding an answer in the books I appealed to the mysticism and ancient esoteric practices. At that time the communism ideology crashed down in our country and we got the opportunity to travel all over the world. I started spending time in India and Nepal, trying to find answers in the old practices. Answers appeared as an insight into the understanding of inner mechanisms which rule human behavior. I continue with the practices of getting information from Heavenly Force up to date. I raise a question and during meditation I get crucial answers. After this I transform this knowledge into the books which are comprehensible to most people who want to change their lives. I spend a lot of time in Nepal, this is my favorite country, where at foothills of Himalayas I get the brightest insights. Everything I got during such contacts I test on myself and then share with people through my books, lectures and training. As a result, today I am the head and owner of several enterprises, including the Center of Positive Psychology “Sensible Path” in Moscow, Russia and the American Academy of success THE SENSIBLE WAY, INC., Boston, Massachusetts. I am the author of ten books the printing of which totals in over eight million copies and they are translated into several languages. I have a PhD degree, I’m an active member of the Discovery Academy, and author of several inventions. I have a wonderful house in Moscow region with several posh cars including a Porsche and a Rolls-Royce at my garage. I build my Ritrit-centre in foothills of the Himalayas. I have a wonderful wife and I travel around the world to give lectures and provide training. In short, I created the life that I had wished for myself. No one but yourself can keep you from achieving the success that you desire. Many people in the world have already used the recommendations offered here, changing their lives miraculously. To illustrate it, let me quote letters that I received from some of my readers. Your book changed my life! Deep from my heart, I would like to thank you, Alexander, and God for sending you to Earth! Thanks to your wonderful book, I gained a deeper knowledge of Life’s laws. You explained why we should act in one way and not in another, and what happens if we act otherwise. Please accept my sincere words of gratitude for your books! They transformed my life. I feel so peaceful and quiet now! Thanks to you, I realized how strong my Angel is and I want to thank him in writing. Thank you! But it is only the beginning, as I have a strong desire to get to know more about myself and the world, and to correctly achieve my desired goals. With great pleasure, I read your books, which I found unexpectedly, and understood that they are what I need and have been looking for. These books explained in a simple and comprehensible way many of the reasons for my problems that I did not even think of. Several of my friends and acquaintances liked those books, too. They even thought that if they had been published earlier, they could have avoided many mistakes in life. We could show hundreds more similar quotations from readers’ letters, but I think the ones quoted above are self-explanatory. In principle, most requirements of human behavior in our world have been well known for a long time. They are the basis of almost all religions. The matter is that in religious texts; the concepts very often are explained in a complicated and not always coherent language, and they never seem to be based on logic that we can easily understand. Perhaps, it was enough for people living in the past. Yet, today, the principle “trust and do as told” does not work because people want to understand what happens around us and how, finding the reasons why we should observe these exact rules and not some others. That is why it would be good to translate the requirements of Life into a simple and explainable modern language. I tried to do this in my book. Our studies show that we have the right and ability to have any of Life’s gifts, and we may set any goals and achieve them. Many authors write about it. Unfortunately, these recommendations do not always work, and we found the reason why! It turns out that, before realizing our desires, we should start harmoniously interacting with the surrounding world and accept this world as it is. This means that we should stop condemning what, in our opinions, are the world’s certain flaws. If we do not do it, we break Life’s requirements for our behavior, and our failure provokes the consequences, i.e., troubles, illnesses, accidents, and inabilities. But as soon as we stop violating these requirements, all our troubles miraculously come to an end. Life starts to bring us joy and anything we want. 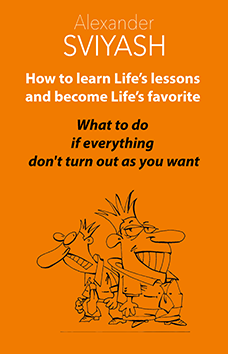 In this book, we will explain in detail how you can learn to live without grievance and other suffering in our world, which is imperfect in our opinion; you will also learn how to make Life bring you only happiness. Let’s Expand the Borders of Knowledge! In our view, we cannot exclusively use the notions that we learned at school or in college because the knowledge offered there is always based on science. Science is materialistic— that is, it only considers real things that can be measured, touched, divided into particles, etc. There exist, however, different phenomena in our life that modern science is unable to explain. In the future, science most likely will significantly expand the scope of data about the surrounding world and explain everything it currently denies or considers a miracle. Yet, we are not going to wait for that to happen and will use religious and esoteric (i.e. hidden) knowledge in our reasoning. Using the information given in this book, any person—even in the most difficult circumstances—can drastically change his or her life to the better (if he or she wants to do so, of course). It is a right. Our book is merely a resource that clarifies why difficult problems arise in our lives and how we create them. We provide you with information, and you arrive at the conclusions on your own. Using this system, many people reconsidered their attitude toward Life. Consequently, their love life improves, they find money or a job they desire, their business becomes successful, and the illnesses disappear. So we offer you help, and you decide whether you want to use it or not. If you decide to use my system, you will learn how to fight problems that the ancient people believed were provoked by some “vicious spirits.” Yet, we believe that they are provoked by our incorrect attitude to this world. This Book Is Not Materialistic. As already mentioned, in our method, we proceed from the fact that besides the visible world—that is, the one that we can touch, measure or, physically see—there also exists an invisible or “unseen” world. The “unseen” world includes everything that we still do not yet know about the environment. In the future, science will probably reveal all the mysteries, but it will not happen soon. We believe that there is another invisible version of our world, and we think we can interact with it to our advantage. In this book, we will often use the notion of “Life” (i.e., Heavenly Powers, God, the Creator), which merely implies available, invisible powers that influence our reality. There exist many religious, philosophical, and esoteric models of the unseen world. Any of them suits us. Our method does not contain prayers or religious rituals; in this respect, it appears more like a materialistic psychological theory. We also consider, however, practical ways of interacting with the unseen realm, and in this regard, our method is not materialistic at all. That is why both believers and non-believers can use it. In general, our method is compatible with any religious concept because it stands beyond religion. You can perform the rituals of your faith, using, at the same time, this method because they do not contradict each other. The information provided in this book explains no more than 80% of the negative events that happen in the world. The remaining 20% involve people who can be considered “special,” and these cases need to be researched and explained. “Special” people have lives that are different from those of the majority. They are overwhelmingly rich people, famous public figures, show business superstars, serial killers or maniacs, the insane, and those who have been disabled from birth, among others. Their lives and problems are very different from those of most of us. That is why we do not consider these people as much here, and we will be talking more about “us,” ordinary people. waiting for anybody’s help. When all your troubles go away, you will be left with joy only, living your happy and successful life. One of the advantages of the suggested method is that is perfectly tailored to the pace of our modern life. To use it, you do not need to have any special abilities, extra time, or extra space. You can use it at any moment of your free time. You can use our exercises while driving a car, riding a bus, or standing in line. It is very convenient because you do not have to change the usual pace of your life. Later in this book, I will use the pronoun “us” instead of “I.” The reason is that here I speak not only from myself but as a champion of Above which want to give the people information about how to use opportunities which were given the day they were born. This Is a Short Version of the Complete “Sensible Life” Method. This book is the third edition of a manuscript written in 1998. It has been a while since then, but people who have not read the book still do not have the lives that they would want. They are not the favorites of Life; they are its stepchildren. They have a real possibility of making their lives more harmonious and successful, and they merely need to reconsider some of their beliefs and rules. That is why many people still need this book. 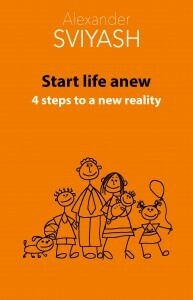 This book contains the main ideas of what we call the “Sensible Life” method. Over the past few years, it has gained a lot of support in many countries. We provided many recommendations and examples of using this approach in different areas—in love and family life, in business and at work, and when dealing with health problems. All of this information is summarized under the main title, “Method of the Sensible Life,” and in the full volume, it is covered in Books 1–6. It is also on the Web at www.sviyash.com. Many people in several countries around the world already use this method, and their lives have changed dramatically for the better. Previously unattainable goals have become real for them. 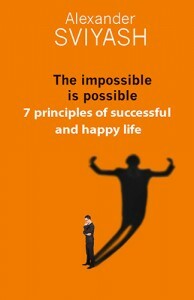 If you enjoy what you read in this book, then later you will be able to familiarize yourself with the rest of our Sensible Life method and use it to reach your essential goals. The American Academy of success THE SENSIBLE WAY will help you on this path through its trainings and private consulting provided by specialists. I am inviting you to make your life more conscious and happy, and I wish you success on your way!